Where am I? - Here's a photo of a spot in Upper Falls without its surrounding context. The game is to look at the photo and identify where in Upper Falls you can see this lollipop shaped piece of utility infrastructure (answer below). It's Getting a Bit Nippy Around Here - Reader Mary Durr asked "Does anyone know why these small bottles (nips) of Smirnoff Raspberry Vodka are lying empty on the streets of Newton Upper Falls? They seem to be everywhere in NUF!" I hadn't noticed them, so the next morning, on my morning walk around the neighborhood I kept my eyes open. I didn't see any raspberry vodka bottles but I did come across 30+ empty nips of Christian Brothers Honey Brandy all around one parking spot in the corner of the All Star Liquor parking lot. It appears as if someone has a regular routine of parking in that spot, drinking a nip or two and dropping the empties out the window. I spoke to the manager at All Star Liquors. He was sympathetic but a bit pessimistic about improving the situation. He said that in general, nip customers don't tend to be the most responsible citizens. He said that he regularly reminds nip customers to toss their trash responsibly. He's also open to posting a written reminder at the register ... but he says "don't hold your breath" for a drastic improvement as a result. Spring Cleaning Time - The Hemlock Gorge spring cleanup will be this Saturday, April 20. Meet at the Hamilton Place parking lot any time between 9AM - 10AM. Help clean up the park (and keep your eye out for nip bottles) for a few hours and you'll be treated to a free lunch courtesy of Dunn-Gaherin's restaurant. The following week, Sunday April 28, is NewtonSERVES day. NewtonSERVES is an annual day of volunteer activities across the city. 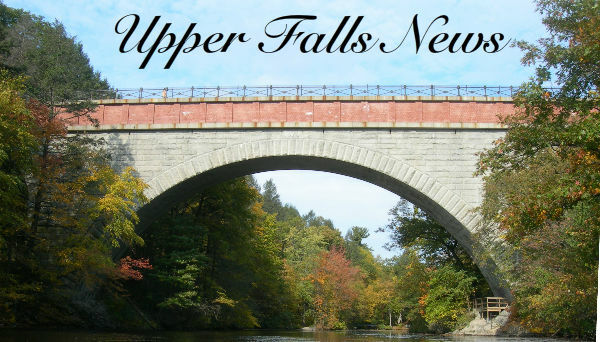 This year, we'll have two NewtonSERVES projects in Upper Falls. Alderman Deb Crossley will lead a cleanup of the Martin and Barney Conservation areas, the two pocket parks on Circuit Ave. Also on that same day, there will be a cleanup of the future Upper Falls Greenway. Come on out and help spruce up the neighborhood. To sign up as a volunteer for either project click here. Come Walk the Pipes - There's a very interesting six mile walk that goes right through Upper Falls called the aqueduct trail. This Sunday at 1 PM, you're invited to come "walk the pipes". It will probably take 2 1/2 1 to 3 hours. Or, if you like, you can walk half of it and we'll ferry you back to the start. A few times a year the Newton Conservators organize a walk of this route, this Sunday though it will be an Upper Falls News-led tour. Meet at 1PM on Echo Bridge and please let us know if you plan to join us for the whole or half the walk. Here Today, Gone Tomorrow - Village 14 reports that Jonathans Bar & Grill on Needham St has closed "due to losing their lease" - just shy of their one year anniversary. Nothing to Worry About - If you happen to notice a suspicious looking piece of equipment attached to the underside of the Elliot Street bridge over the Charles River - don't worry. The city's engineering department is measuring the bridge's shake, rattle and roll with a small seismograph. There's been some degradation in the stone arch that supports the bridge and the city's trying to get a handle on exactly what's going on there. Which Way is Up? - Reader Dave Downs wrote "I find it very hard to orientate the "Playground Construction" picture (in 3/27/12 Upper Falls News). It's unfortunate that the horses block the closest buildings. I realize that the picture may predate many buildings that we think of today, AND I realize that I just may not imagine the correct orientation from which the picture was taken. BUT I don't see the old fire station #7 that was at the top of Pettee St. I also don't see the old school that existed before the current Emerson School. If you look towards the left back of the picture there is a building hidden in the trees that looks a lot like the Emerson School with the four chimneys and squared off roof. If it is the Emerson, then this land is at a distance from the school." Take a look at the photo and see if you can figure out what we would be looking at today. Which direction is the photographer facing? If you have any ideas, send them to us. Give and Take - The Second Baptist Church will be having their bi-annual "swap shop" this Saturday, April 20 from 10:00 a.m. until 2:00 p.m. Everyone's invited. Bring something to swap, come without anything to swap, just donate or just come and see if there is something you need. It is all free! Did You Know ... that every continent has a city called Rome except for Antartica? "Did you know ..." features an interesting and random fact every issue, collected by ten-year-old Upper Falls resident Jayla Reilly. 'Where Am I" Answer - The "lollipop" is near the corner of High St and the Route 9 slip road. This is the view up High St from the corner. It's not clear what this piece of hardware is for. A guess is that it has something to do with electricity distribution. The faded lettering says something about "cables". 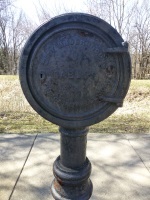 Thanks to Jim Lerner for contributing this week's "Where Am I"